Raunds Town boss James Le Masurier admits there’s a confidence crisis at Kiln Park. Three straight defeats have left the Shopmates eighth in the ChromaSport & Trophies United Counties League Division One table with seven games to go this season. Their next assignment is at high-flying ON Chenecks tomorrow (Saturday). Raunds were hammered 5-0 at Chenecks in the last eight of the NFA Junior Cup in January and since then they’ve had only one win in all competitions – a 3-0 victory at rock-bottom Stewarts & Lloyds. The latest setback was a 3-1 reverse at home to Bugbrooke last weekend and Le Masurier admitted: “We are lacking confidence at the moment. “Last week’s game could have been different. But a few things didn’t go our way, our heads dropped and we became vulnerable. “We need to find some confidence from somewhere. “We remember how bad it felt when we lost at Chenecks in the cup and hopefully that memory will help motivate the players. “A lot of games at this level are won by the team who works the hardest but, as a manager, there’s only so much I can do to motivate the players. “It’s up to them to achieve the standard we set earlier in the season. Le Masurier admits he may bring in players from the reserves as the Shopmates prepare for a difficult run-in that includes matches against Lutterworth Athletic, Potton and Peterborough Sports. Of the Shopmates’ seven remaining games, five are at home and Le Masurier added: “We need to make home advantage count. Rothwell Corinthians are making themselves a team to keep an eye on in the race for promotion. Shaun Sparrow’s team picked up an excellent 1-0 win at second-placed Chenecks on Tuesday, thanks to Andy White’s first-half goal. Corinthians are now gearing up for another huge game against fellow high-flyers Whitworth at Sergeants Lawn this weekend. 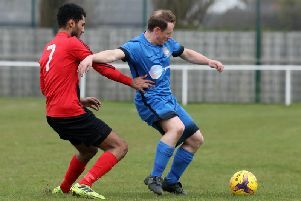 The Flourmen’s own hopes suffered a setback on Wednesday night when they lost 5-3 at Bugbrooke. They led twice in the first half through Cavell Jarvis and Deven Ellwood but were 4-2 down at half-time with James Gorman’s second-half goal proving to be only a consolation. Elsewhere this weekend, Thrapston Town make the trip to Blackstones while Burton Park Wanderers are on the road at Bourne Town. Rock-bottom Stewarts & Lloyds, meanwhile, take on title-chasing Northampton Spencer at Occupation Road.